Acids increase the concentration of hydrogen ions, while bases decrease the concentration of hydrogen ions. Acids taste sour, are corrosive to metals, change litmus (a dye extracted from lichens) red, and become less acidic when mixed with bases. Acids and bases affect daily life because they play a role in many reactions, from digesting food to cleaning soap scum off a shower wall. The amount of acidity or alkalinity that is in a solution is measured by the term pH. pH measures of the amount of protons or hydrogen ions that are present in an aqueous solution. Acids are primary contributors to the measure of pH in a solution, and the presence of acids is a key characteristic of almost all solutions, from blood in the body to foods and drinks we consume. Under the Brønsted-Lowry definition, both acids and bases are related to the concentration of hydrogen ions present. Acids increase the concentration of hydrogen ions, while bases decrease the concentration of hydrogen ions. where [H+] = H+] is in units of moles of H+ per litre of solution. 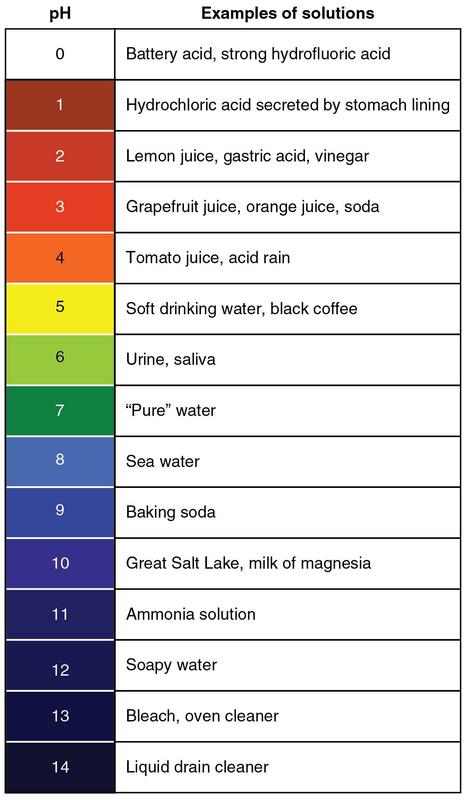 The pH scale is a scale that is used to represent the level of acidity in a solution. The pH scale ranges from 0 to 14. Substances with a pH between 0 and less than 7 are acids Substances with a pH greater than 7 and up to 14 are bases. Right in the middle, at pH = 7, are neutral substances, for example, pure water. Table1 pH scale of common solutions. An acid dissociates, or breaks apart, and donates protons, or hydrogen ions, in an aqueous solution, while a base donates hydroxide ions in a solution. When acids are added, they release more hydrogen ions into the solution, and this causes the pH of the solution to drop. Remember: more hydrogen ions equals a lower pH and a more acidic solution. Arrhenius's theory also explains why all acids have similar properties to each other (and, on the other hand, why all bases are similar): because all acids release H+ into solution (and all bases release OH-). The Arrhenius definition also explains the process of neutralization: acids and bases counteract each other and a base can make an acid weaker, and vice versa. Weak acids are acids that partially release the hydrogen atoms. These acids may lower pH by dissociation of hydrogen ions, but not completely (not to pH=1, for example). Weak acids include acetic acid, which is vinegar, and citric acid found in oranges and lemons. Strong acids, on the other hand, completely dissociate and release every hydrogen atoms present in their molecules. This means that strong acids are more potent in lowering the pH of a solution when compared with weak acids. There are only 7 strong acids, including hydrochloric acid, which can be found in the stomach, and sulfuric acid, a corrosive acid found in things such as car batteries and fertilizers. In the molecule on water, the electrons in the HO bonds aren't shared equally by the hydrogen and oxygen atoms. These electrons are drawn toward the oxygen atom in the centre of the molecule and away from the hydrogen atoms. As a result, the water molecule is polar. The oxygen atom carries a partial negative charge (δ-), and the hydrogen atoms carry a partial positive charge (δ+). When they dissociate to form ions, water molecules, therefore, form a positively charged H+ ion and a negatively charged OH- ion. The opposite reaction can also occur: H+ ions can combine with OH- ions to form neutral water molecules. The fact that water dissociates to form H+ and OH- ions in a reversible reaction (indicated by the double arrow) is the basis for an operational definition of acids and bases that is more powerful than the definitions proposed by Arrhenius. An acid is any substance that increases the concentration of the H+ ion when it dissolves in water. A base is any substance that increases the concentration of the OH- ion when it dissolves in water. To decide whether a compound is an acid or a base, we dissolve it in water and test the solution to see whether the H+ or OH- ion concentration has increased. -Acetic acid is the main component of vinegar. -Dilute Sulfuric acid is the electrolyte used in the lead-acid batteries in your car. -Ascorbic acid is vitamin C.
-Lactic acid is produced as milk or dairy products go bad - this is what makes them sour.